The present investigation was aimed to isolate and characterize the strains of Drechslerella dactyloides and Dactylaria brochopaga from decaying root galls of tomato in order to investigate their role in reprogramming of root apoplast that enhance defence responses in tomato pre-challenged with Meloidogyne incognita. Out of 23 strains of D. brochopaga and D. dactyloides were isolated from decaying root galls of tomato, three strains of D. dactyloides and five strains of D. brochopaga were found effective and these were selected for further characterization under controlled laboratory conditions. Further, D. dactyloides NDAd-05 and D. brochopaga NDDb-15 were found most promising strains for control of M. incognita. 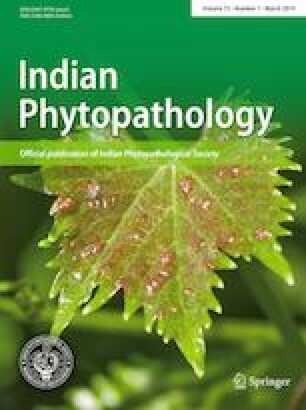 The study elucidates multifarious effects of D. dactyloides NDAd-05 and D. brochopaga NDDb-15 inoculated either individually or in combination on tomato plants pre-challenged with M. incognita under nethouse conditions. Results of this investigation revealed that inoculation of D. dactyloides NDAd-05 and D. brochopaga NDDb-15 increased various attributes in plants to significant degree conferring defence against M. incognita. Both the strains were found to have potential to enhance site-specific accumulation and activation of defence-related mediator molecules, enzymes and thus, exhibited biocontrol potential against M. incognita. Further, application of D. dactyloides NDAd-05 and D. brochopaga NDDb-15 not only assisted in the growth promotion but also activated phenylpropanoid pathway in root apoplast in addition to direct trapping of M. incognita. Shailendra Singh, Wasiullah Khan, Deepti Malviya these authors have contributed equally to this work. We would like to express our special thanks to Dr. R.K. Singh and Dr. K.P. Singh, Department of Mycology and Plant Pathology, Institute of Agricultural Sciences, BHU, Varanasi for providing technical support to carry out a part of this research work. Our special thanks goes to Science and Engineering Research Board (SERB), Department of Science and Technology, Ministry of Science & Technology, Government of India for providing financial support to Udai B. Singh, under Fast Track Scheme for Young Scientist (SR/FT/LS-42/2012) to carry out the research work.